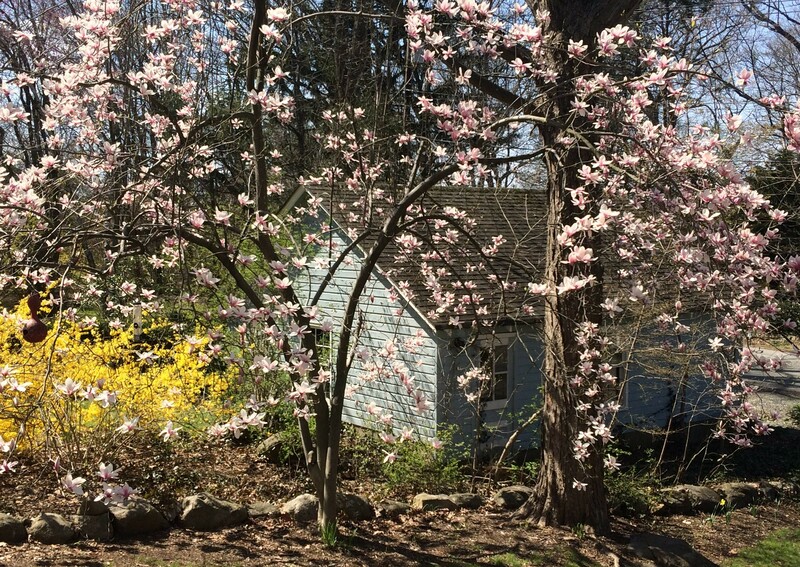 In the shady canopy of our mountainside home, a sweet magnolia grows. 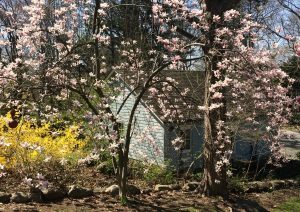 Every April, delicate pink and white blooms grace its slender branches. This is our tenth spring here, and I think it may be only the second time our magnolia has had so many flowers. I love my tree. It is beautiful. Not everyone agrees. True, the branches are rather spindly. Even in its fullest bloom, it looks a bit sparse. Judged against other more magnificent magnolias, it is surely not the grandest. But I think it may be the strongest. You see, our sweet magnolia is growing in less-than-ideal conditions. We have quite a few trees on our property. Sometime long ago, some forebear of our home decided to plant this magnolia in the shade of three large sugar maples. I question the gardening wisdom of this, but I am grateful. The little tree serves me well. My sweet magnolia is the only tree in our yard with branches low enough to hang a birdhouse. A gourd that a friend grew, hollowed, and painted deep, rich-red hangs from a low-slung branch. I watch small birds come and go through its tiny opening while I drink my morning tea. More recently, my darling husband gave me a bird feeder for Christmas. In winter, we sit at our table and watch cardinals, blue jays, sparrows, wrens, and woodpeckers take turns eating the seeds. One morning, we watched in delight as a very determined squirrel did some pretty amazing upside-down aerobic maneuvers in an effort to grab his share of the bounty. We only saw this once, and thankfully, the squirrels seem generally disinterested. The magnolia adds early spring color to a very green, mostly shady landscape. While it is in bloom, the towering maples are just bearing their first buds, giving the smaller flowering tree a short window of full spring-time sun. Once the maples are verdant, the magnolia has long dropped its petals. Beautiful, broad green leaves appear, giving shade to the birds that gather in its branches and providing a low canopy in that little corner of the garden. My magnolia reminds me of a song that my daughter and I love to sing. The song is actually about wandering from home, but we love the refrain, “wildflowers don’t care where they grow.” I always think of that song whenever I see flowers growing in impossible places, not caring that the landscape is less-than-ideal. This is how I want to be, and how I want my daughter to be: growing, blooming, and thriving, even though our circumstances are not always sunny, well-watered, or nourishing. Someday, God will restore the garden He perfectly created in the beginning. And He will restore me, His child, to perfect relationship with Him. When that time comes, there will only, always be ideal growing conditions. Then I will walk in His garden, and I will sit in the shade of the sweetest magnolias. My sweet magnolia, in all its springtime glory. This entry was posted in Life Musings, Uncategorized. Bookmark the permalink. Oh, what a timely word! Thank you, Friend and Covenant Mama!